In the office we are big fans of Toy Story, we watched the films again over Christmas! 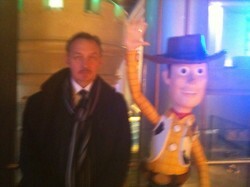 So, we couldn’t resist getting a photo with one of the team and the superb Woody! Woody was charming, polite and a very happy chap!